“In a bend of the coastline, at the outlet of a valley, scattered around the forts, gardens and coves in a picturesque manner…here is the pleasant town of Collioure. The prospect is charming” (V.-E. Ardouin-Dumazet quoted in J.D. Herbert, Fauve Painting, The Making of Cultural Politics, New Haven, 1992, p. 92). This peaceful painting shows the beautiful town of Collioure in the South of France, near the Spanish border. Light and warm colours fill the background of the painting as the sun sets on Fort Miradou and the Pyrenees rising in the distance. Martin-Férrières’ colouristic boldness and gestural exuberance in the quick brushstrokes and intense colours has captured the atmosphere and light of this sleepy town. The son of the famous Impressionist painter Henri Martin, Jacques Martin-Férrières knew Collioure from his father who rented a studio overlooking the port in 1923, enchanted by its remote location and serene atmosphere. 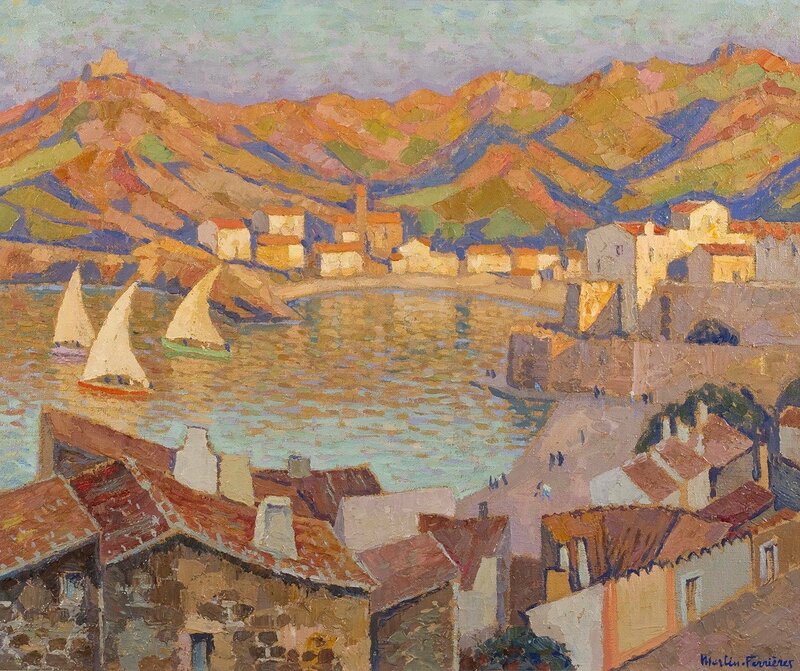 Collioure had long been a favourite of the Fauve and Neo-Impressionist artists of the early 20th Century. By 1905, Henri Matisse, Paul Signac and André Derain had fallen in love with the Catalan splendour and leisurely charm of the seaside town, incorporating its landscape into some of their most remarkable works. Following its ‘discovery’, the sleepy seaside village began to enjoy a burgeoning summer industry: artists, poets and writers drawn by the warm Mediterranean climate and easy pace of life moved to the town throughout the war years and into the 1920s. Painted during the last decade of his life Collioure, vue du Miradou vers le faubourg, soleil couchant is an intimate snapshot into the artist’s life, the intense colouration and short loose brushstrokes a tribute to his father. Jacques Martin-Ferrieres was born in 1893 in Saint-Paul de Vence in South Eastern France into a family of artists. Studying under Cormon, Ernest Laurent, and his father Henri Martin, he became known as a painter of portraits and landscapes. He exhibited regularly in Paris at the Salon des Artistes Français and was able to submit work without vetting. There he received an honourable mention in 1920, a silver medal in 1923, and a travel scholarship in 1924.In 1925, he received the national prize before finally being awarded a gold medal in 1928. He was also awarded The Legay-Lebrun prize (Prix de L’Institut). In 1965 he exhibited in Paris in an exhibition of Venetian landscapes and snow landscapes. He became known for his use of thick impasto which created a surface of great vitality and a wonderful basis for his experimentation with the effects of light.